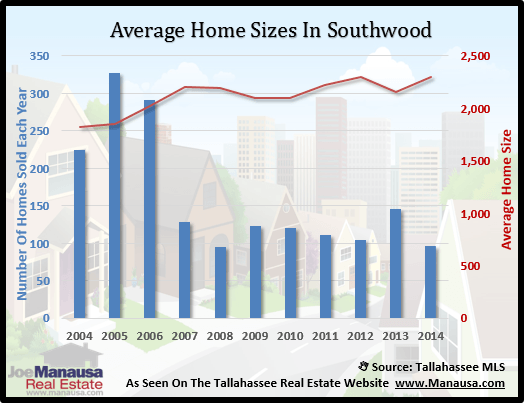 Southwood continues to hold on to its top position among the most popular neighborhoods in Tallahassee, with 93 homes sold through mid September. Roughly one in every 6 homes sold thus far in 2014 have been new construction, which has helped bring average home prices and home values higher this year. 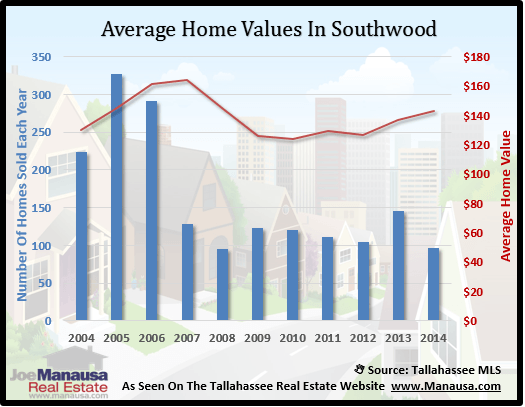 In our report, we will look at prices, values, and sizes of homes in Southwood, as well as show current listings in the Tallahassee MLS and all closed home sales going back to 2002. 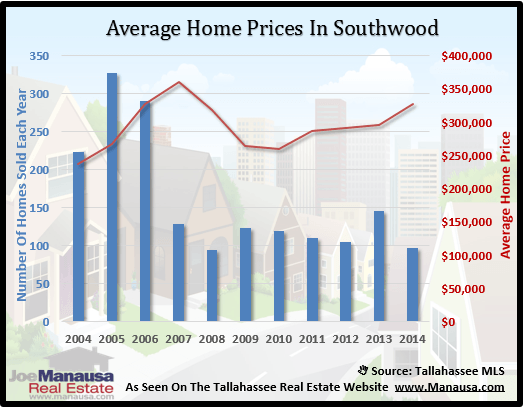 Home prices have been rising in Southwood since 2010, but this year's rate of growth tops the previous three years. In all the graphs in this report, we see the number of closed home sales for each year (blue bars, measured on the left vertical axis), and a specific statistic shown in red (measured on the right vertical axis. In the graph above, we see that the average price for homes sold this year is currently at $326,000, and the number of homes sold is on pace to be one of the best in the past 8 years. Home values have been on the rise for the past two years, with the current average sales value (measured in price per square foot) to be about $143. New homes are currently selling around $165 per square foot, while existing home sales are averaging closer to $139 per square foot. This is still well below the high of $160 per square foot established in 2006, but rising values are good for the market nevertheless. There are hundreds of homeowners who need values to rise before they will have enough equity in their homes to be able to move. I like to evaluate average home sizes as well. We can often see values move differently than prices, and the reason is due to the homes being selected by homebuyers. When interest rates decline, we typically see buyers "buy more home" for their dollar, while the opposite is true when interest rates rise. Currently, the bigger homes are selling in Southwood. The average size of new homes being sold is 2,066 square feet, while the average existing home size is much larger at 2,320. This is why the difference in average values is greater than the difference in average home prices. The following list of homes are the most recent listings in Southwood. The following list shows home sales going back to 2002 in Southwood. I hope you enjoyed our September 2014 update on home sales in Southwood, please feel free to drop me a note if you have questions not covered in this report.